Ankur Tewari is a Mumbai based singer-songwriter. He has composed music for over three bollywood films from – Aao Wish Karein, Raat Gayi Baat Gayi, Ek Chalis Ki Last Local & Lets Enjoy. His underground hit ‘Sabse Peeche Hum Khade’ has been used in two movies and has been covered by Silk Route. The title track from his album Jannat was licensed for the movie Soundtrack. He formed a Hindi rock project, called Ankur & The Ghalat Family along with Gaurav Gupta, Sidd Coutto and Johan Pais (of Tough On Tobacco) in 2009. the Mumbai-based act has been playing festivals and gigs and enthralling audiences with their fun and happy songs (that are best paired with a glass of whiskey) since. Get ready for some beautiful, simple Hindi lyrics packed with some intense whistling on both ends. The band has played in almost all the major music festivals in the country, ranging from NH7 to Sula Wine Fest to Music in the Hills. 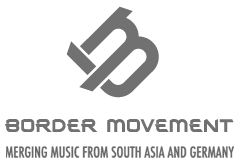 They are a popular band in the college circuit and are fast gaining popularity overseas with their collaborations with producers MiDiVal Punditz and Yoad Nevo.